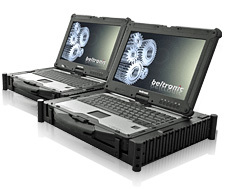 ...Unique Rugged Convertible Notebook Based on the Intel® i7 microprocessor with an Integrated Extension Unit for PCI Express slot and all I/O on MIL connectors. Bit Tradition has developed and now produces a Rugged Convertible Notebook Bit-RCN-1320 with an Integrated Extension Unit, which brings improved withstanding against environmental impacts on the Bit-RCN-1320 besides an additional flexibility on the usage of electronic interfaces. Due to consequent application of connectors dedicated designed for extreme environmental conditions, all interfaces, standard as well as customer specific, can be used now under any circumstances and conditions. 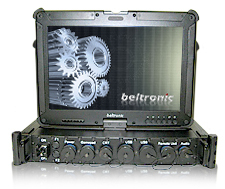 Opposed to typical outdoor computer systems (e.g. IP protection may be violated due to open flaps when attaching cabling to interfaces) the Bit-RCN-1320 with the Integrated Extension Unit will keep alive all requirements, even with external data cables being attached. This includes also the usage of the SD and the PCI Express Card slot. The Extension Unit provides the customer application enough space to place the required cabling inside the Extension Unit and to bring the data connection to the rear side connectors. The design of the rear box connector plate was made in terms of easy access to cabling and most possible flexibility, when it comes down to special customer requirements. The Bit Tradition Extension Unit also provides an extended input voltage range. While typical laptops require a fixed voltage, the Bit-RCN-1320 Extension Unit provides a wide range from 18V up to 36V in the standard version. Other DC ranges can be easily integrated on request. The Extension Unit integrated DC/DC converter has no impact on the battery functionality of the Bit-RCN-1320. The Bit-RCN-1320 can be used as always with the integrated battery pack without the loss of any integrated or additional functions given by the Extension Unit. All connectors are IP65 approved and MIL STD 38999 compliant. In addition, all connectors are also RoHS compliant due to the surrender on Cadmium based surface treatments. Other configurations are easily to adopt just by replacing the rearbox connector plate. The Extension Unit is equipped with 1/4" and 3/8" stainless steel made threading's on the bottom side of the system, so a simple and flexible usage of standard or custom tripods as well as GorillaPods (tm) is possible. As an option, the Extension Unit can be equipped with an additional sun shield, dedicated for the tablet mode of the Bit-RCN-1320. While the sun shield can be removed easily and toollessly, it can be also used as an additional protection of the Bit-RCN-1320 when it is not in use. Field Application based on Frame-Grabber PCI Express Slot Card. 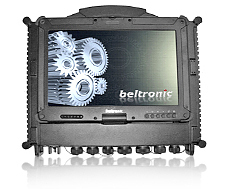 Besides the standard version of the Extension Unit as the base for custom adoption, Bit Tradition also offers factory approved function add-ons like single or multi channel analog frame-grabbers. Based on the Imperx VCE Analog Framegrabber as PCI Express Slot Cards, Bit Tradition offers 1 and 2 Channel ready-to-use solutions with or without additional trigger inputs.